The office of 75-year-old developer Nelson Rising has a decidedly un-septuagenarian feel. The space, inside the Beaux-Arts PacMutual building in Downtown Los Angeles, is teeming with millennial energy, as evidenced by the generation’s typical accoutrements, including a Ping-Pong table and open plan layout featuring cement floors. The latest projects overseen by the chairman and CEO of Rising Realty Partners seem to echo the relationship the developer has to the office — they all involve taking something old and making it feel young again. PacMutual is a case in point. Rising bought it for $60 million in 2012, then stripped it of decades-old drywall, got rid of the dropped ceilings and replaced the carpeting. The redeveloped creative office building attracted “#Girlboss” Sophia Amoruso’s Nasty Gal as a major tenant. The hype allowed Rising to sell it for $200 million in 2015 to Ivanhoe Cambridge and Callahan Capital Properties, though he retains his office there. Although Rising is among the elder statesmen of Downtown development, he only formed his eponymous real estate investment and operating company in 2011. He has reinvented himself over the years, wearing such varied hats as lawyer, campaign manager and Hollywood movie producer. He has also contributed to the DTLA skyline with structures such as the U.S. Bank Tower. Today, Rising is back where it all began for him — redeveloping the very building where he started his career as a young lawyer in 1970 — the Title Insurance Building at 433 South Spring Street. The Real Deal recently sat down with him in his hip headquarters to get his insights into DTLA, the challenges of redeveloping historic buildings, and why density is a good thing. You spent your early childhood on the East Coast. What brought your family west? I came to L.A. in 1951 because my father worked for the Statler Hotel in D.C. He was the building superintendent, and then he moved out here when the L.A. Statler Hotel, which became the Hilton Hotel, was built in 1951. That site is now the Wilshire Grand. You see it in the skyline. It is truly remarkable. So I am a big believer in Downtown. How has Downtown changed in your lifetime? When I was a young lawyer, I lived way out in the Valley. Now, being a young lawyer paid on that same basis, it might be better to live in an apartment Downtown. All of sudden, you gain two hours you would have spent commuting. You have more time to enjoy your life. When you formed your company, you shifted from ground-up development to historical restorations. What influenced that? We felt — and we were correct in feeling — that there were opportunities to take the wonderful historical buildings Downtown and bring them into this different time period. There was great demand for that. What are some of the challenges of historic restorations, and how have you overcome them? The biggest challenge is the seismic stability. Some historic buildings can easily be restored, and others cannot. So you have to pick the right building, which we’ve done. You also have to hire the best people, which we do. You are redeveloping the building where you began your law career. What are your plans for it? Offices. And we’ll probably have a restaurant on top. I have fond memories there. I went to UCLA Law School, and through my second and third year, I was a clerk at O’Melveny & Myers, at 433 South Spring Street. Then I graduated and passed the bar and had a permanent office there. Who was influential in your life during that time period? How did your campaign experience come into play when you were producing the movie “The Candidate”? You took a fake candidate to the actual Democratic Convention? Yes. The Fontainebleau was the convention hotel. We had some of the most beautiful young ladies you have seen, as far as the eye could see. The movie did very well. You recently bought the Garland Center, a fully leased data center. How does that play into your strategy? Are you trying to diversify beyond historic projects? It is not quite that scientific. You have to be opportunistic. It came on the market and we felt we had the skill set to manage it and improve it. If we find things that are complicated, and we have a solution, we can probably pay less than somebody who couldn’t figure it out. When you were building the U.S. Bank Tower, was there any sense of competition with Donald Trump, who was then trying to build the nation’s tallest building in L.A.? Oh, no. We were ahead of the game. And also, the site [Trump was vying for] is a long way from Downtown. So it would have been a tower built with nothing around it, at the same density as Downtown. There’s a lot of contention in L.A. about how much density we should have, and where we should have it. What’s your take? Density is a good thing, if it is properly planned. It leads to civilized living. When L.A. was being developed, we built farther and farther out. So guess what? It took you longer and longer to get to work. Density is the way around that. There are those who say that there is too much density. Why? Well, traffic. And you don’t have to have traffic if you have transit. I’d argue that the density is better than urban sprawl. What is your son Chris’ role in the company? Chris is the president. He has a very hands-on and active role in managing the company an brings an innovative perspective towards unlocking the value in properties such as PacMutual. If you had no obligations for a weekend, what would you do? I’d be on the golf course, at the L.A. Country Club, or I’d be in the desert at the Vintage Club in Indian Wells. 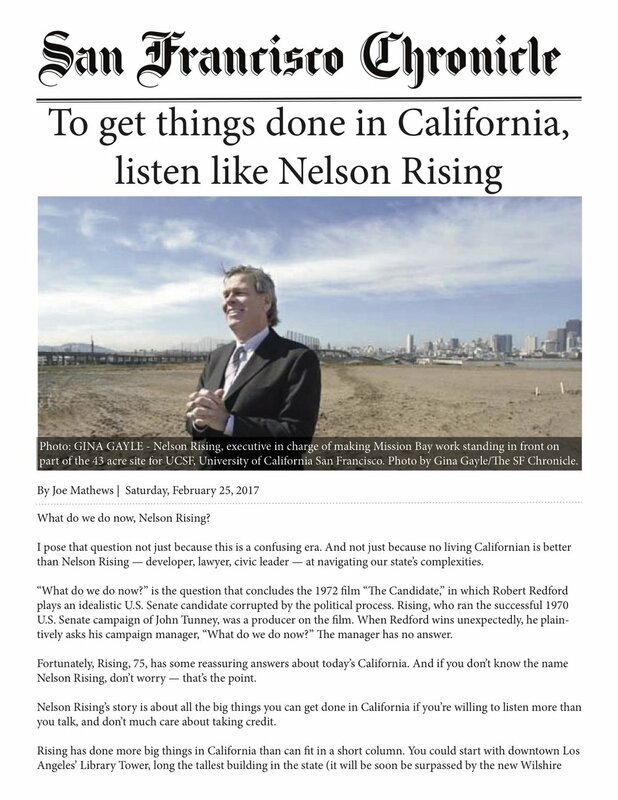 Nelson Rising is a man on a new mission – on his old turf. Having spent much of his career leading the development of some of the biggest new skyscrapers in downtown Los Angeles, the 74-year-old real estate veteran is now watching that area transform, and much of it by his own hand. For he has shifted the focus of his company, Rising Realty Partners, to adapting old buildings there into high-end creative office projects. For example, his firm acquired One Bunker Hill last month in a partnership with Houston real estate investment firm Lionstone Investments. We sat down with Rising at his downtown office to talk about his legacy and future plans, his passion for politics and even what it’s like to play golf with Donald Trump. LOS ANGELES—In the wake of the Fed’s decision to leave interest rates alone, the industry has erupted in a debate about whether the move was good for the economy or not. Nelson Rising, the chairman and CEO of Rising Realty Partners and the former chairman of the San Francisco Federal Reserve Bank, wasn’t surprised by the decision based on past legislation that requires the economy be in a position of maximum economic growth. If you ask the economist crowd what they think about the Fed's decision to keep interest rates where they are, you'll hear all about trouble in China, the eurozone and a number of other global concerns. But what does it mean for the local developer? Bisnow chatted with LA legend and Rising Realty Partners CEO Nelson Rising (here with Alan Greenspan) to find out.